Awaken & Grow: A Practical Guide For Your Spiritual Journey gives you the inside track on not only the process of our Spiritual Journey but also takes you a step further and shares what to do once you've had your awakening. From insight and guidance to tools and tips, Awaken & Grow is a crash course in our reason for being. Christine Agro shares her almost 20 years of receiving insight and wisdom about why we are here, what we are working, how we are working on it and how to step deeper and deeper into a state of conscious living.Awaken & Grow: A Practical Guide For Your Spiritual Journey gives you the inside track on not only the process of our Spiritual Journey but also takes you a step further and shares what to do once you've had your awakening. 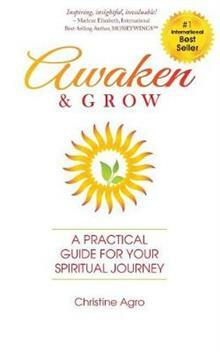 From insight and guidance to tools and tips, Awaken & Grow is a crash course in our reason for being. It turns your AHA moment into an AHA life! Christine Agro shares her almost 20 years of receiving insight and wisdom about why we are here, what we are working, how we are working on it and how to step deeper and deeper into a state of conscious living. Awaken & Grow is broken into three parts: Awaken, Grow and Putting It All Together.In Awaken, Christine takes you through the phases of our awakening process, explains why and how we awaken and why we don't come in awakened in the first place. In Grow, she explores the three stages that our growth takes us through - no matter what lesson you are trying to learn, you are going to move through these three stages and understanding this can help you move more quickly and more easily through the process. She also explores the three core life lessons we are all working on, lessons that are the root of any conflict you might experience. Understand this and you will be that much closer to learning those lessons and moving forward on your journey. In Putting It All Together, Christine dives into some of the tools to help you navigate your Spiritual growth and shares some of the ways that living an Awakened life can help you create the life you love. As Christine is experiential in nature and believes in doing over reading, so at the end of the book, she's included a link that takes you to the Awaken & Grow Bonus Package which includes mini video courses designed to help you move the information in this book from your mind to your body.